In 2010, 31,560 people ended their own lives and about 20,000 people died or went missing with the earthquake. Unemployed widower Fujio Murai’s family tragedy contains instances of both. 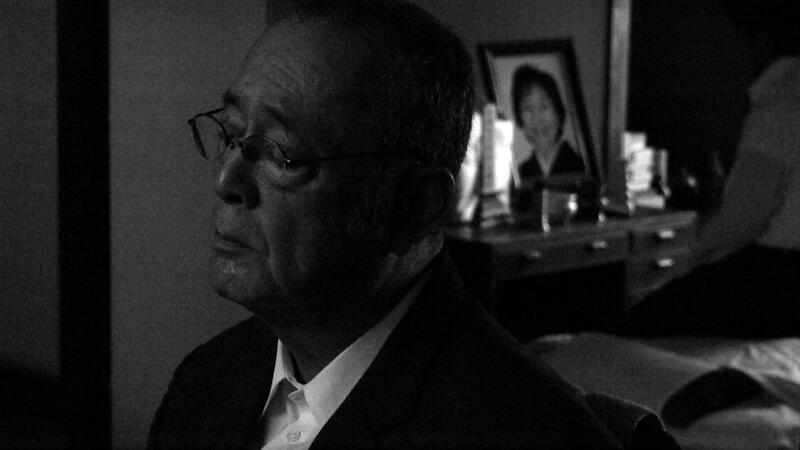 diagnosed with lung cancer, Fujio refuses surgery and returns home with his son Yoshio; his daughter-in-law and granddaughter unseen since the earthquake. In complete despair, Fujio locks himself in a room with a photo of his wife and announces that he will mummify himself within his home. Yoshio is not able to stop his father. director Kobayashi Masahiro’s camera doesn’t miss any of what happens within Fujio’s house, with consistent, fixed positions throughout the film capturing Fujio’s tragedy. The only respite from the oppressive mood of the black and white images is the short sequence recalling how Fujio and his wife met Yoshio and his wife holding their newborn. Ironically, those vivid and colorful scenes seems like a faded past, with Fujio’s present an exemplar of the misfortunes of modern Japanese.